The most frequent shock presenting to the Intensive Care Unit is septic shock,, which has the highest mortality rate compared to other forms of shock. Mortality reaches 40 percent but can be reduced with proper evaluation, sufficient fluid resuscitation, and early antibiotic administration. On the other hand, one of the least common shock subtypes is obstructive shock., We are presenting an obstructive shock secondary to complete occlusion of venous return without compression of the heart or involvement of the pulmonary vessels. A 72-year-old Caucasian male patient who is a current smoker presented to the emergency department (ED) with dysuria, subjective fever, mild confusion, and dizziness. He denied shortness of breath or loss of consciousness. Two days earlier, the patient was in the ED for foley catheter removal that was placed for obstructive uropathy due to benign prostatic hyperplasia. Medical history was significant for stage II chronic kidney disease and multiple kidney stones status post lithotripsy. Surgical history was significant for a road traffic accident (RTA) 15 years ago requiring surgery and right hip osteoarthritis with avascular necrosis status post replacement. He is a nonalcoholic and denied any illicit substance use. Physical examination revealed mild fever (100.1F), tachycardia (111 bpm), hypotension (70/40 mmHg), and tachypnea (29 bpm). Cardiopulmonary and abdominal examination were unremarkable. Extremities showed bilateral edematous swelling, more so on the right leg. His initial arterial blood gases were normal with an inspired oxygen fraction of 28%. The leukocyte count was 15.9 × 103/μL with 85% neutrophils and hemoglobin was 10.9 mg/dl. Other hematologic and coagulation parameters were within the normal range. Serum bicarbonate was 22 mEq/L, creatinine 3.4 mg/dl, blood urea nitrogen 39 mg/dl, lactic acid 3.2 mg/dl, whereas other serum chemistries and liver function tests were unremarkable. Urinalysis was positive for leukocyte esterase and a high white cell count. An electrocardiogram and serum troponin levels were normal. Based off this presentation, septic shock was suspected. Therefore, blood cultures were ordered and broad spectrum intravenous antibiotics were started. Despite proper fluid replacement, hypotension was persistent, and ultimately, a central venous catheter was placed. High doses of intravenous norepinephrine were required to improve his blood pressure and mental status. Bedside ultrasonography was performed to evaluate the fluid status and to evaluate the peripheral edema. 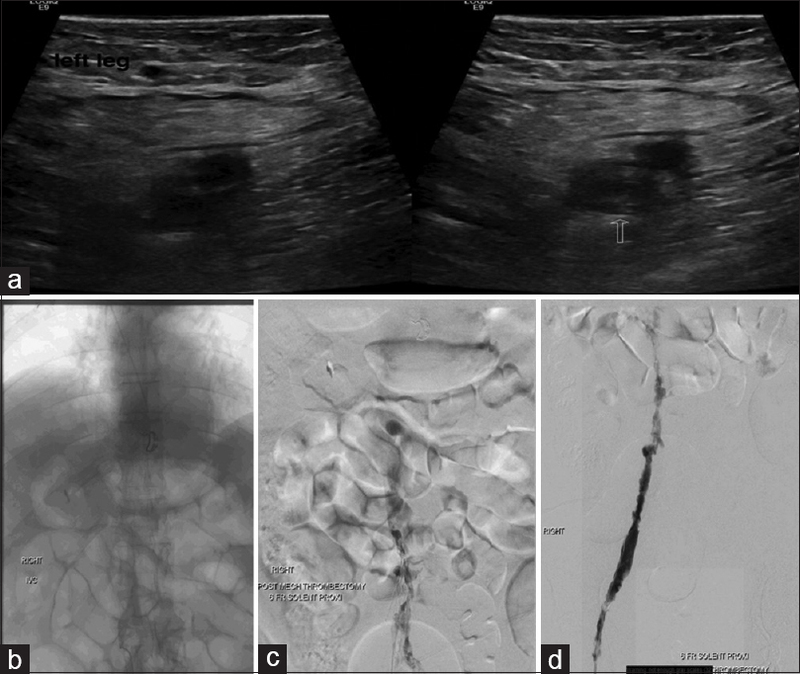 Ultrasound revealed good cardiac contractility, no intra-abdominal bleeding, and showed bilateral noncompressible femoral veins as a sign of deep vein thrombosis (DVT) [Figure 1]a. Due to suspected pulmonary embolism, echocardiogram was performed and showed an ejection fraction of 60% with normal right ventricular ejection fraction and dimensions. Computed tomography (CT) pulmonary embolism protocol was negative. CT abdomen showed bilateral nonobstructive renal stones and some stranding suspicious for a small retroperitoneal hematoma. Reevaluation of the patient presentation and history with his family confirmed that he had a RTA complicated with DVT on the right leg and treated with inferior vena cava (IVC) filter placement 15 years ago. In the absence of significant improvement with proper septic shock management and no significant sepsis source, obstructive shock secondary to IVC obstruction was entertained. Venography was performed to evaluate the patency of the IVC [Figure 1]b. There was almost complete occlusion of the IVC at the level of the filter. In addition, it showed filling defects were noted within the distal IVC and bilateral common and external iliac veins as well as the common femoral veins compatible with thrombus. Slight hypertrophy was noted of the collateral arising from the left common iliac vein suggestive of long-standing obstruction. Mechanical thrombectomy was then performed [Figure 1]c and [Figure 1]d. A total volume of approximately 350 mL thrombus was removed. Given the suspicion for retroperitoneal hematoma, he was not a candidate for catheter directed thrombolysis. After the removal of the clot, the patient did not require any intravenous pressors. The patient was started on unfractionated heparin after discussion with multiple radiologists and monitored closely. The stranding in the retroperitoneum was considered to be edema due to congestion. His hemoglobin did not drop, and he was discharged on Rivaroxaban with no recurrence of thrombosis for the following 3 months. Given the chronicity of his IVC filter, radiology, and vascular surgery recommended against endovascular removal, which means that he will be on anticoagulation for the rest of his life. Preventing pulmonary embolism formation from DVT is a priority in the acute and chronic setting. IVC filters effectively reduced the incidence of pulmonary embolism as well as optimizing the venous flow dynamic but simultaneously increased the incidence of DVT formation., We have reached a point where placing an IVC filter is a bedside procedure. Complications of surgery for filter placement limited their use initially, but now advancements have made it easy to place a filter under ultrasound guidance with little complications. In general, filters are used in patients with anticoagulation contraindication or even as a prophylaxis to pulmonary embolism formation in trauma patients. No mortality improvement was documented with IVC filter placement, but complications such as DVT and perforation are recorded in the literature. Direct thrombus extension can occur through the filter and can lead to recurrent pulmonary embolism or IVC obstruction ,, which might lead to obstructive shock. Obstructive shock is a medical emergency that occurs due to mechanical problems that averts diastolic filling resulting to decreased cardiac output, despite normal intravascular volume and myocardial function, there are physical effect can lead to obstruction during diastolic filling of the ventricles which is due to decrease return to the heart patient will present with shock symptoms. Symptoms and signs of obstructive shock vary depending on the extent of the damage and acuity, which include confusion, loss of ability to concentrate, unconsciousness, chest pain, shortness of breath, pale, light headedness, and it could present with resistant hypotensive status. In our presentation, obstructive shock was most probably secondary to the impedance of venous return by the extensive thrombosis at the IVC. The lack of other etiologies of shock, infection, abnormal cardiac function (right or left), or significant neurologic deficit as well as the quick reversal of shock immediately after mechanical removal of the clot from the IVC all point to an obstructive etiology to shock. One might argue that the shock could have been secondary to an inflammatory reaction to thrombosis. That is a possibility and probably did contribute to the shock but that would not explain the complete and almost immediate reversal of shock and improvement in renal function. With this case report, we seek to alert the practicing intensivist and the emergency medicine physician to consider occlusion of the great vessels other than the pulmonary artery or aorta as causes of obstructive shock. IVC obstruction should be considered in cases of undifferentiated shock. In addition, IVC filters should be removed once their indication has resolved. Furthermore, it may be helpful to consider performing a point of care ultrasound scan to evaluate all shock patients in ED to rule out the presence of an obstructive process. Mobin-Uddin K, Callard GM, Bolooki H, Rubinson R, Michie D, Jude JR. ≤Transvenous caval interruption with umbrella filter≥ (fee required). N Engl J Med 1972;286:55–8. doi:10.1056/NEJM197201132860202. PMID 5006878. Sakr Y, Reinhart K, Vincent JL, Sprung CL, Moreno R, Ranieri VM, et al. Does dopamine administration in shock influence outcome? Results of the Sepsis Occurrence in Acutely Ill Patients (SOAP) Study. Crit Care Med 2006;34:589-97. Becker DM, Philbrick JT, Selby JB. Inferior vena cava filters. Indications, safety, effectiveness. Arch Intern Med 1992;152:1985-94. Zhou D, Moon E, Bullen J, Sands M, Levitin A, Wang W, et al. Penetration of celect inferior vena cava filters: Retrospective review of CT scans in 265 patients. AJR Am J Roentgenol 2014;202:643-7. Pais SO, Tobin KD, Austin CB, Queral L. Percutaneous insertion of the Greenfield inferior vena cava filter: Experience with ninety-six patients. J Vasc Surg 1988;8:460-4. Stavropoulos SW, Sing RF, Elmasri F, Silver MJ, Powell A, Lynch FC, et al. The DENALI Trial: An interim analysis of a prospective, multicenter study of the Denali retrievable inferior vena cava filter. J Vasc Interv Radiol 2014;25:1497. Vincent JL, De Backer D. Circulatory shock. N Engl J Med 2013;369:1726-34. Rodgers KG. Cardiovascular shock. Emerg Med Clin North Am 1995;13:793-810. McAree BJ, O'Donnell ME, Fitzmaurice GJ, Reid JA, Spence RA, Lee B, et al. Inferior vena cava thrombosis: A review of current practice. Vasc Med 2013;18:32-43. Ahmad I, Yeddula K, Wicky S, Kalva SP. Clinical sequelae of thrombus in an inferior vena cava filter. Cardiovasc Intervent Radiol 2010;33:285-9. Tardy B, Mismetti P, Page Y, Décousus H, Da Costa A, Zeni F, et al. Symptomatic inferior vena cava filter thrombosis: Clinical study of 30 consecutive cases. Eur Respir J 1996;9:2012-6. Joels CS, Sing RF, Heniford BT. Complications of inferior vena cava filters. Am Surg 2003;69:654-9.